After gaining city status in 2012, Chelmsford in Essex has recently revealed the town’s bid to become the UK City of Culture in 2025. The initiative is designed to raise the chosen city’s profile, and if successful would generate a significant amount of social and economic benefits for the area. The exciting regeneration that is already underway has put Chelmsford firmly on the map, and presents an ideal opportunity for house buyers in Essex to invest in this flourishing city. This vibrant area in Essex will particularly benefit families, as Perryfields Junior School in Chelmsford has been crowned the highest rated school in the county. According to Key Stage 2 results released by the Government, a staggering 99% of young pupils met the expected standard in reading, writing and maths. This news follows soon after the school was ranked number 13 on a list of the top 250 state primary schools in England. Just five minutes from the highly-regarded school, Bellway Homes has a stylish collection of three, four and five-bedroom homes. 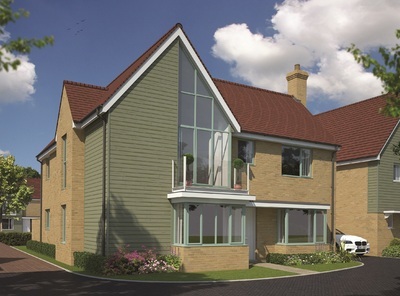 The Gleneagles house type is a five-bedroom home, with open-plan living space that extends over three floors. The kitchen features a selection of integrated appliances, including a double electric oven, gas hob, extractor hood dishwasher, fridge freezer and microwave. Access to the rear garden is available through the kitchen and dining area via bi-fold doors. A cloakroom and two storage cupboards complete this level. On the first floor, the master bedroom benefits from a fitted wardrobe, an en suite and for selected plots, a balcony. The second bedroom has the similar luxury of a fitted wardrobe and Juliet balcony, and shares a large family bathroom with the third bedroom. On the second floor, the remaining bedrooms share a modern shower room. Chelmsford is home to two large shopping centres, Meadows and High Chelmer, both approximately four miles from the development. The larger of the two is High Chelmer, with over 80 retailers ranging from popular brands to independent boutiques. To unwind after a day of shopping, the award-winning centre is surrounded by nearly 100 pubs, restaurants, wine bars and street cafés along the High Street. The Meadows also offers over 40 stores and eateries, as well as an eight screen Odeon cinema to enjoy. For leisurely activities, residents will have access to a wealth of opportunities, with Civic theatre staging drama, live music and comedy just 11 minutes away by car. Outdoors, there are over 22 parks across the city, as well as quaint villages and historic buildings tucked away in this part of East Anglia. The development is close to a number of well-regarded schools, including Little Waltham CE Primary School only a six-minute drive away. For older students, Chelmsford County High School for Girls and Kind Edward VI Grammar School are both less than a 10-minute drive from Eagle Rise at Channels. Eagle Rise at Channels is ideally situated for an easy commute into the capital, with a journey time to London Liverpool Street of just 34 minutes from Chelmsford Railway Station. Less than a ten-minute drive from the development, the station also has frequent services to Stratford for Canary Wharf and Docklands. For access to major roads by car, the A12 is eight minutes away, and the A130 is two minutes away with links to B1008 and A120 for Stansted Airport, which is 15 miles away. Prices at Eagle Rise at Channels start from £434,995 for three-bedroom homes, £519,995 for four-bedroom homes and £599,995 for five-bedroom homes. The five-bedroom Gleneagles house type is priced at £599,995. For any further information, visit bellway.co.uk.